Rule 1: Always remember that tuxedo needs to be in black color. If you already have one in black then for the second one you can opt for a dark blue in Persian. This is an alternative color you can choose. Rule 2: You can either go for single breasted jacket or double. Preferably, single breasted jacket would be better because it is easier to find and this always remain in trend as compared to double breasted jacket. Rule 3: Make sure your jacket should have a peaked lapel or a shawl collar. Peaked lapel has a pattern below the neckline and shawl collar has a smooth collar with slight thickness at the neckline. Rule 4: You can also go for something like a side vent but we really don't recommend that. Never go for center vent. Moreover, vents are not acceptable because they make the fitting go inappropriate, thus, causing discomfort. Rule 5: Make sure the buttons of the tuxedo are not covered. Rule 6: The fabric of your trousers and the jacket should be same. One of the important rules to follow. 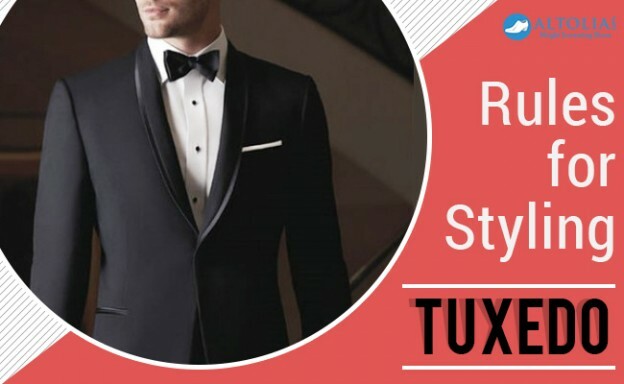 In fact all the pieces of tuxedo must be of same fabric and lastly, it's not important for belt loops in tuxedo trousers because you wear it a bit high and can also go for suspenders. Rule 7: Wearing a dress watch can never let you down; go for something which has classic dial and a metal border with simple leather strap. Simplicity at its best! Rule 8: Wearing court shoes with tuxedo is a big YES. If not court shoes, the Oxfords can also enhance your look. Rule 9: For accessories, please don't overburden your look. A pocket square would be enough to gather all the limelight. Suspenders can also work but not the loud colors. Watch and socks needs to be perfect – black preferably. Only black bow tie please – no textures and patterns. Rule 10: White shirt is always saved for evening and we already know that the combination of black and white always work. Cufflinks can be added if you want. Wearing a tuxedo requires a disciplined and the sharpest look. But make sure you are clean shaved with controlled and nice sleek hair.